And before I forget: yes, another bloom of 4 petals. I wanted to make a kusudama with a darker look and it turns out nice. Once again 24 units, diameter of 6.5~7 cm. 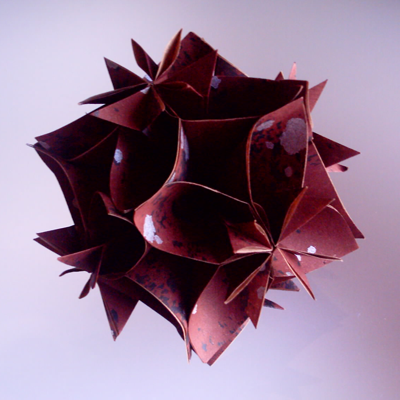 This was made with regular wrapping paper of a dark red colour with specks of silver and black here and there. This entry was posted on 2007|03|10 at 14:05 and is filed under kusudama, modular origami. You can follow any responses to this entry through the RSS 2.0 feed. You can leave a response, or trackback from your own site. Olá… O seu site é muito LINDO! Seus origamis são muito bem dobrados!! Se você permitir, vou linkar o seu site ao meu blog, tá ok?